Will digital brassware become more commonplace in the bathroom? Digital water delivery for the bathroom is nothing new, offering precise temperature control and personalised flow for tailored experiences. But ISH saw developments of digital technology, recently take a step forwards. 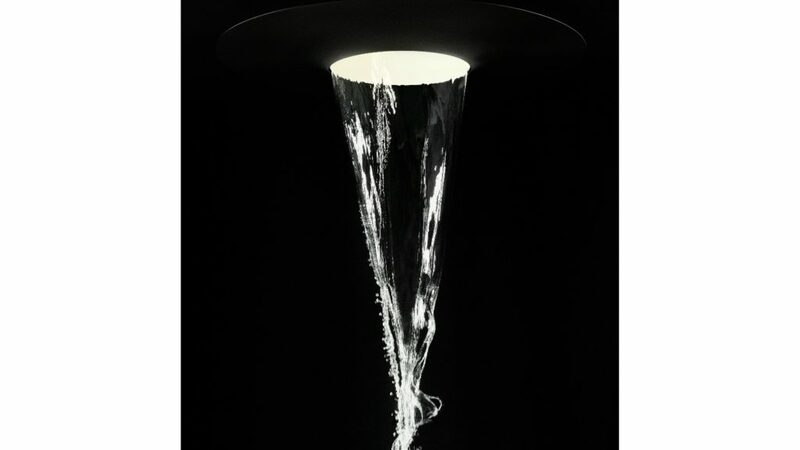 The likes of Hansgrohe and Dornbracht unveiled their holistic showering experiences for the luxury market, which combine choreographed water flow with lighting, music and fragrance. Managing director at Dornbracht Andreas Dornbracht explains why multisensory experiences are becoming more significant in showering: “Because we live in an age when speedy is everything, in a time of digital transformation and upheaval, people are increasingly pressurised in their daily life. “With this in mind, it is increasingly important to maintain personal good health – both physically and mentally. This demand for a holistic showering experience saw Dornbracht introduce Aquamoon at ISH 2019, which was shown as a concept at ISH 2017. Using a touch screen, bathers can call up Signature Treatments which combine a choice of four water flow patterns, light and fragrance to create a choice of three moods. In addition, with the Dornbracht Smart Water App, bathers can download additional Signature Treatments. Designer for Dornbracht Michael Neumayer is convinced: “We need personal safe havens, where we can experience moments of happiness. And Aquamoon was joined by the RainTunes range at Hansgrohe which also linked water, light and sound to embrace all the senses. Head of Global brand marketing at Hansgrohe Marc Andre Palm explained the rationale behind its launch, stating: “We conceptualise water in the bathroom in completely new dimensions with a focus on the individual and their multi-sensory experiences. 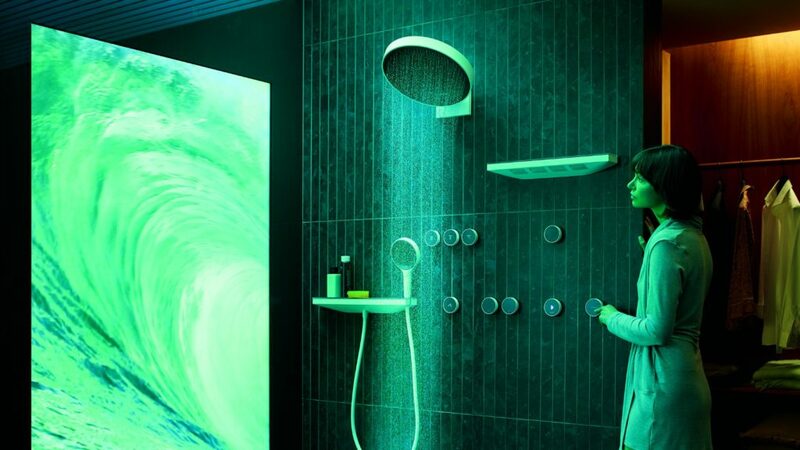 Certainly Hansgrohe has sought to achieve exactly that offering seven multisensory experiences, and featuring its own range of RainScent fragrances. These have been developed by a team of dermatologists, sports physicians, physical therapists and aromatherapy specialists. Controlled by an App or digital RainPad control, it links water flow with the smart home such as Bluetooth technology for music and Phillips Hue lighting to create the overall experience. Of course, these digital showering experiences are for the premium end of the market, but industry experts believe they are fast filtering into the general populace. 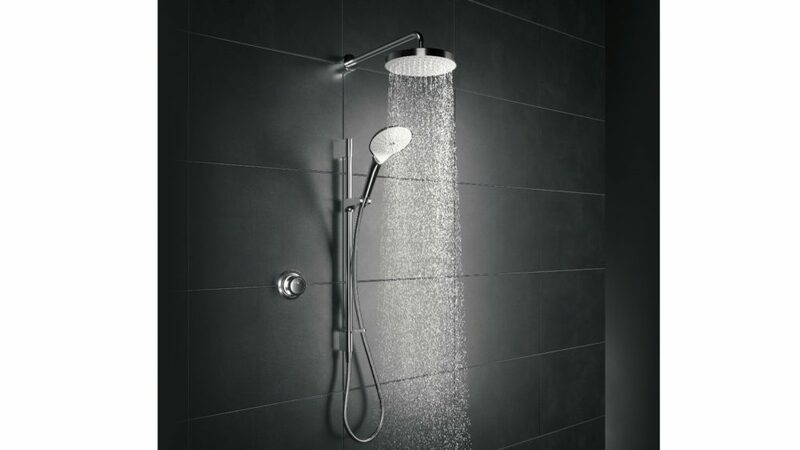 Reflecting this, Grohe introduced a digital control which could be used with any overhead shower, while Hansa introduced the HansaEmotion Wellfit shower, operated by button or App, to provide three wellbeing shower programmes. And the likes of Mira and Triton are bringing more affordable digital showering to the mass market. Head of industrial design at Mira Showers Roland Boal explains: “From a global perspective our approach seeks to bring together the latest technology with core design cues, enabling the bathroom to provide a highly personalised experience. Mira now offers the digitally controlled Mira Mode and the Triton Host shower offers digital technology at an affordable price. In fact, marketing director at Triton Showers Tina Simpson says “In a recent survey carried out by Triton, around 80% of respondents said they would seriously think about purchasing a digital shower in the future. However, still to catch up to digital showering are electronic mixers for the basin and bath, despite Grohe introducing Ondus mixer taps 15 years ago. However, this year at ISH saw the launch of a digital mixer into its Grohe Plus range. Featuring a white glass plate on top of the spout, it features an LED temperature display, which is colour coded to match the heat of the water and a sensor control to change the standard 5.7litre per minute flow to 4 litres per minute. 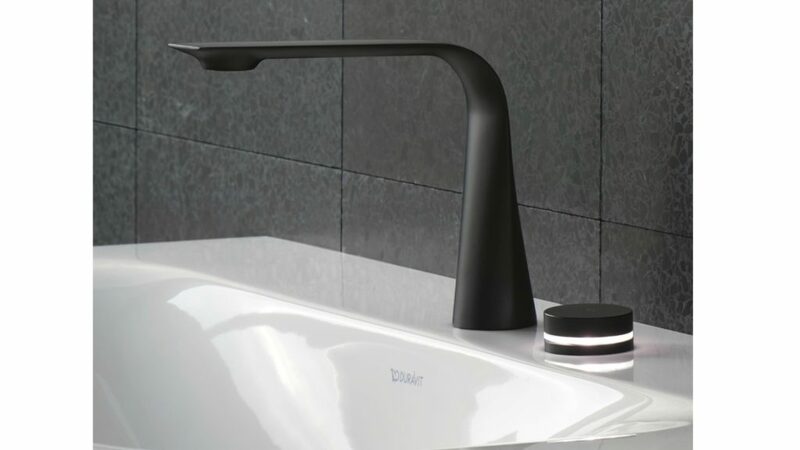 While Duravit introduced an electronic variant in its Mattheo Thun and & Antonio Rodriguez-designed D1 tap range at ISH. Although a concept for the commercial market, Ideal Standard previewed the Intellimix combined digital tap and shower dispenser, which product manager Leanne Martin hinted as a precursor to what may influence its future residential portfolio. With the creative director of Ideal Standard Roberto Palomba also commenting “technology is a way of life”, at ISH, digital mixers could certainly be a category to watch in the future.